DnBuster's Place: FRESCHETTA Simply Inspired review and Giveaway! I received a coupon for a FREE pizza and a neat square Bamboo cutting board with cheese knives for review from Social Spark and Freschetta. Freschetta is available in Eight distinctive flavor varieties including Harvest Supreme, Classic Bruschetta, Hawaiian Style, Chicken Bianco, Farmers Market Veggie, Rustic Pepperoni Pomodoro, Southern BBQ Recipe Chicken, Tuscan Farmhouse. Freschetta Simply Inspired Pizzas feature larger cuts of fresh-tasting vegetables, a light crispy crust, flavorful, real cheese and signature sauces, creating deliciously different pizzas from toppings to bottom. They are also packed using the new Fresch-Taste seal package, which locks in the vibrant flavors, while using 30% less packaging material. Visit freschettasimplyinspired.com to learn more about the varieties, and find which flavor is simply... you! Harvest Supreme ~ It had wonderful toppings including roasted red onions and Italian sausage! It was easy to prepare, the pizza too 12 to 14 minutes at 425 degrees. The kids ate this pizza so fast! The reviews from them were great! My oldest son it was better than take out! My youngest son said it was the best tasting pizza he had ever ate! All of the kids loved it and we will be buying more Freschetta Simply Inspired pizza varieties the next time we go to the store! We all gave it a 5 stars for taste and flavor! Thanks to Social Spark and Freschetta for the chance to do this Yummy review and giveaway! Giveaway~One of my lucky readers will win a coupon for a complimentary Freschetta Simply Inspired Pizza (valued up to $8.59) and a round bamboo cutting board. 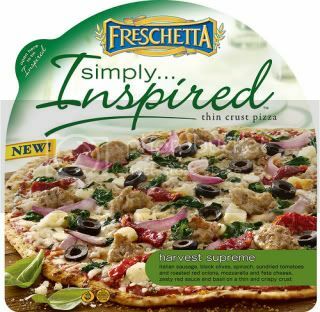 To enter please visit http://www.freschettasimplyinspired.com/ and tell me which variety of the Freschetta Simply Inspired pizza you would like to try! ~This must be done before other entries will count. ~ Please include and email address in all comments so that I can notify you in the case you are the winner. Like Freschetta Simply Inspired on Facebook and Follow Freschetta Simply Inspired on Twitter. ~ Freschetta is offering weekly giveaways of awesome prizes on these pages through the rest of 2011! For one entry each (one entry per comment) Follow my blog via Google Friend Connect, Follow my blog via email, Follow me on twitter, Like me on facebook, Follow my blog via networked blogs. Giveaway will end June 1st @11:59 CST. Winner will be picked via random.org and will have 48hours to send mailing info to receive the prize of the coupon and cutting board or another winner will be picked. I will be mailing the prize to the winner within 48hours of getting info. Thanks again to Freschetta Pizza and Social Spark for providing me with the coupon and cutting board! All opinions are my own. I'd like to try the Hawaiin. I follow Freschetta simply on twitter as humanecats and Facebook as Ricky Todd. I would love to try the Harvest Supreme pizza! I would like to try the Classic Brushetta. The Hawaiian Style pizza looks yummy!!! I would like the Classic Bruchetta. We would love to try the Harvest Supreme! Pizza is a fave in this house and we have it atleast once a week! I love the Hawaiian Pizza! The Farmers Market Veggie sounds delicious and I would love to give it a try. I would def. pick the Hawaiian pizza!